Nast was undeterred by Harper’s Weekly editor George William Curtis’s plea for prudence, and moved directly to challenge cartoonist Matt Morgan’s depiction in Leslie’s Illustrated of Grant as the reluctant reformer. 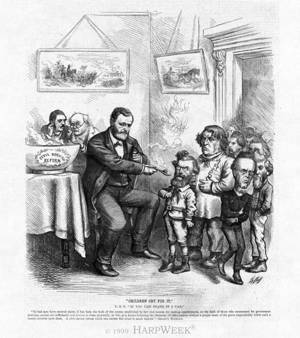 In “Children Cry for It” (dated February 3, 1872; published January 23), the president remarks, “If you can stand it I can,” as he feeds a steaming bowl of “Civil Service Reform” gruel to a group of unreceptive Republican liberals. The lower caption is excerpted from Grant’s annual message to Congress of the previous December, in which he endorsed civil service reform.